a news cameraman to win the favor of a young woman. Tony Zhou has an excellent video series called “Every Frame a Painting.” His latest video is about the artistry and logic behind Buster Keaton’s gags AKA stunts. It’s called Buster Keaton – The Art of the Gag. Watch his stunts and see if you don’t agree that they are still funny and delightful. They hold up very well for today’s audience. In Keaton’s day before talkies, title cards were one way to convey the story, much like narration does in some films today. The average was 240 cards per feature film. Keaton’s films averaged only 56 because he was such a good visual storyteller. He used body language and expression and eliminated the need for many cards by telling the story with action. In today’s world, narration is typically used in place of title cards. Both narration and title cards can be a story-telling crutch. It’s always best to let the action tell the story wherever possible. Surprisingly, Buster Keaton never faked a stunt. Today our movies tend to rely heavily on CGI and editing to “fake” stunts and everything else. It is rare to see stunts that are not edited. 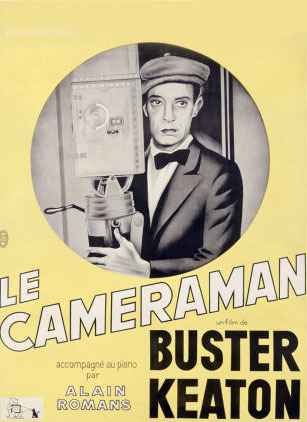 For Buster Keaton, if he had to make a cut, he would throw it out. Enjoy Buster Keaton – The Art of the Gag.